It’s very easy to get very miserable real fast in the outdoors. This is usually related to the weather and rain, snow, and ice that cannot only make you very uncomfortable, but can be life threatening. Experienced campers, backpackers and outdoorsmen and women know the value of protection from the elements. In many ways, water is the most invasive and challenging element we encounter. Cold is a close second but if you combine wet and cold you’re really in trouble. As a result we need to take a lightweight rain jacket or parka a bit more seriously than some of our other clothing. Of course boots are important and so are rain pants, but when the sky opens up and the rain and snow comes down your rain jacket or parka may be the most critical protection you’ll need. As a species we need to maintain an approximate body temperature of 98.6 Fahrenheit. When we start to go a degree above or below we either begin to sweat or shiver. Both are physiological responses trying to stabilize that 98.6 degree body temperature. The challenge is that we lose 40% of our body heat through our head in cold weather, and our metabolism does everything it can to maintain and protect the vital organs in our trunk or upper body. That’s why a rain jacket or parka is so important. Intense shivering is a sign of severe hypothermia. Intense sweating will lead to dehydration and could be a symptom of heat-stroke. There are one-size-fits-all-seasons options. They are usually outerwear that are worn over the everyday clothes you are wearing whether it’s the high-heat of summer or the deep-freeze of winter. Other options are unique to the seasons. They also are intended to be worn over other clothing but have more robust features such as pockets and vents and can be worn as a substitute for additional layers. Many have a zippered lining that can be added or removed to compensate for temperature extremes. The ultimate option is the adventure or extreme rain jacket. They’re intended for serious mountain climbing or serious expeditions into remote and extreme areas from high altitude to deep and dense jungle. Many of these locations don’t offer immediate or local medical assistance so travelers tend to take their equipment very seriously including their rain gear. Quite often these jackets and parkas are worn throughout the day rather as a temporary covering when wet conditions arise. Some rain jackets are designed to be worn during inclement weather and then removed once the precipitation has ceased. Other rain jacket options are designed for full-time wear as a jacket that happens to be water repellent. The conditional gear tends to be cheaper while the full-time gear tends to be more expensive. This gets to a balancing act that we’ll revisit related to water repellency and the tendency of some rain jackets to contain moisture from perspiration. Outdoor activities are typically active physical exercises that cause us to sweat. If you are wearing a rain jacket that does not transpire that perspiration you may find you are wetter from your own sweat than any amount of rain. As a result many people wear their rain jackets only during a rain storm, but others can wear a rain jacket all day and enjoy water repellency during a rain due to venting options.We’ll explore these options and the continued importance of managing transpiration versus precipitation. All purpose rain jackets intended to be worn over existing clothing as an immediate response to precipitation. Once the rain or snow stops the rain jacket is removed, folded and either packed or hung from the backpack or tent to dry. I has all day potential, but is usually intended for occasional use. A rain jacket that can be worn all day long whether it’s raining or snowing or bright and clear. These are permeable membranes featuring brand names like “Goretex” which is a breathable, synthetic fabric that repels water. All have hoods either attached or as a zippered option and various venting features. A rain jacket that crosses into parka characteristics for an all purpose/all season approach. They usually feature a zippered lining that can be added or removed depending on the temperature and the exertion of the person. The hood is usually insulated as well. They tend to be the most expensive options and also feature permeable membranes to breathe out perspiration while repelling precipitation from either rain or snow. 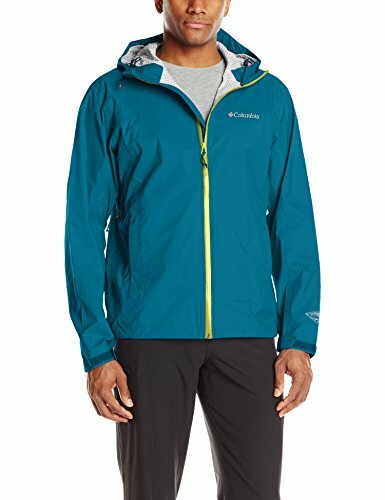 This could almost be thought of as an everyday jacket that you could wear in the city as well Columbia Men’s Evapouration Jacket, Large, Phoenix Blue as the woods. 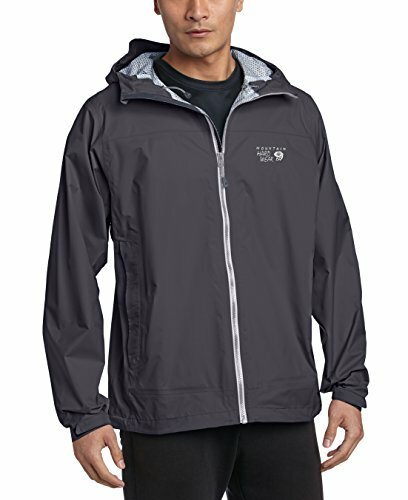 It features a hood and a permeable fabric that provides waterproof breathability. It also features a wicking technology that is exhausted through vents under the arms that are adjustable depending on exertion and weather. It is a very light jacket and folds up into a small size so it is a good option for backpacking. It has pockets and a draw-string on the hood for windy conditions. It’s intended to be worn over existing clothing. Check out this listing for current price quotes. This rain jacket gets a bit more serious and is intended for all day, everyday wear. It’s water resistant and breathable plus the manufacturer says it’s resistant to abrasions. We’re not sure what that means but it sounds durable. It promises something call QTM EVAP technology which makes it both waterproof and breathable. It is, but the science is a bit of a mystery. It actually accelerates evaporation and that helps with its everyday, all day wearability. Like many rain jackets it has vents to help with evaporation and ventilation and pockets that are described as “handwarmers.” The hood is adjustable and Velcro straps allow you to seal your wrists at the cuff. It has been listed for $119.95 but prices may vary depending on your resource or retailer. Okay. Let’s get serious. This next rain jacket also doubles as a parka and is for both temperate weather and seriously cold, alpine conditions. It’s not cheap but that’s the way these things run when you get into expedition gear. Be sure to check out this listing for the latest pricing. This jacket is designed to be worn over clothing layers and has numerous adjustments for both venting and insulation. It is a “Goretex” based jacket and is both permeable and water resistant. The hood is insulated and the pockets are as well. It’s designed as a “looser fit” to accommodate other layers of clothing so you should evaluate the degree to which you’ll use the jacket for cover versus your other clothes when determing the size. It has generous pockets both outside and internal pockets as well for more sensitive gear like cell phones. 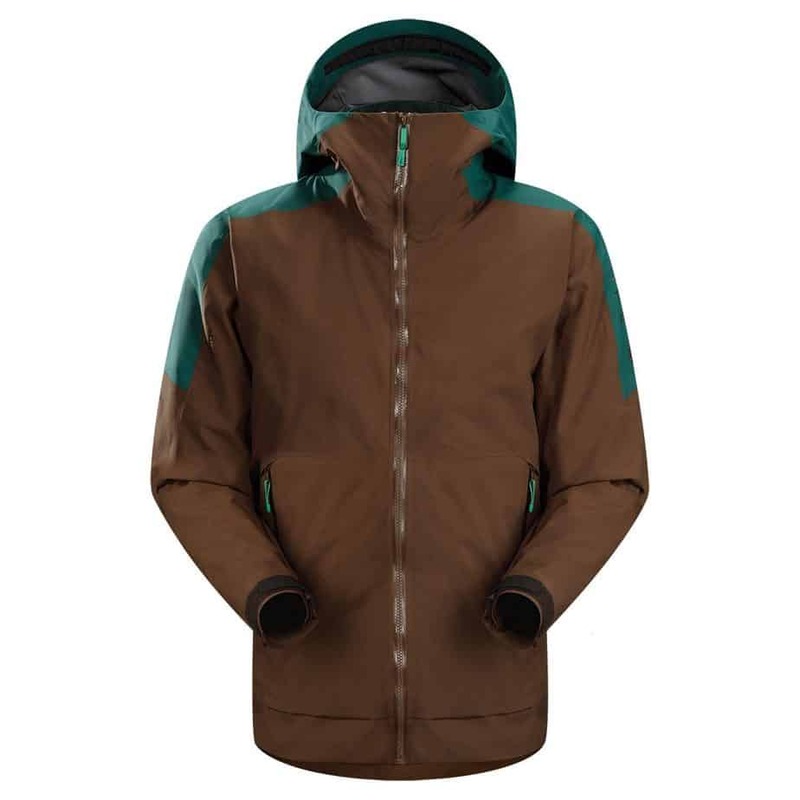 This is a jacket designed for cold weather and alpine conditions so if you’re in the jungle or hiking in mid-summer it may be over insulated for your needs regardless of the venting. It has been listed at $485 but that price can vary. You may be able to find it cheaper at this listing. Your choice for a rain jacket or parka is going to be ultimately driven by your camping/hiking/mountaineering style. 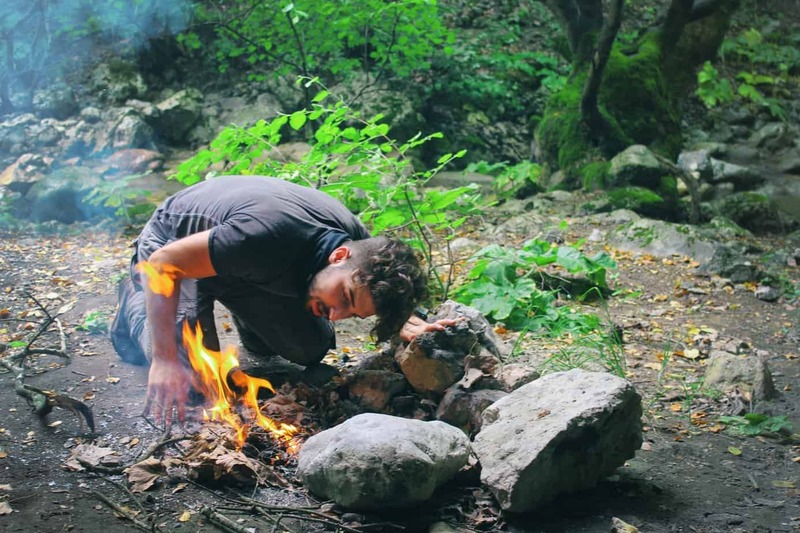 These 3 options are a good place to start, but if you are a purely recreational camper you might want to pursue some more economical options. On the other hand, if you are a serious adventurer or explorer the choice of your rain jacket or parka is a critical decision given the complex conditions and elements your may encounter. The key factors and features to consider are a permeable membrane that allows you to both transpire perspiration while repelling precipitation. It’s a balancing act that can make the difference between comfort and misery and the right choice can make that all much simpler.